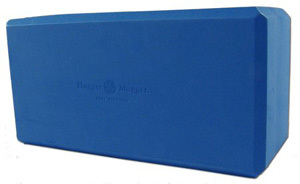 Although I have reviewed yoga blocks I have not written about them nor talked about their many uses. In my own studio I have a collection of many, many blocks and 6 different varieties. If this does not make me an expert then surely it makes me a seasoned consumer of all things block. Yoga blocks are a very handy prop in yoga. For those with limited flexibility they bring the floor to where it serves the best instead of too far away. Placing two blocks beside your feet can help stabilize a lunge pose and encourage proper posture and an elongated spine. Placing a block in front of you in a forward bend can help you keep proper form in a forward bend. Sitting on a block can help reduce discomfort in the back, hips, knees and ankles. Holding a block between your elbows can help you keep your shoulders properly aligned in various poses. Along with the yoga mat, blocks are probably the most fundamentally important tool for the yogi. 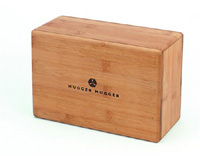 Most of the things involved with yoga really have changed mightily over the years and yoga blocks are not an exception. When I first began doing yoga there were yoga blocks available, but we had to chop down trees to make them. Okay, so we didn’t actually chop down the trees ourselves, but someone did and then they sawed the trees into blanks of wood which were cut into segments, glued together, sanded and varnished. As you can guess this made for a durable, solid and heavy as a rock yoga prop. Woe be unto the student who dropped one of these monsters onto their toe. This was not really a problem because it turns out that most people are innately careful around obviously heavy objects. These wooden blocks were very stable and perhaps they provided some extra conditioning from all the muscle work needed to hoist them around. I like to think they were one of those things that helped to toughen us up back in the day. What a wooden yoga block does not possess is comfort. We did not know this because we had nothing else. We would just wrap up those hard chunks of wood in a yoga mat or place them under a blanket when we wanted to cushion their rigidity. That was just standard practice and nobody gave it much thought. 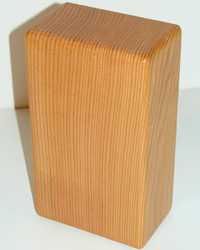 Unlike yoga mats, there have always been yoga blocks, or at least there have been things used as a yoga block. I say always, but there is really no way to verify this. 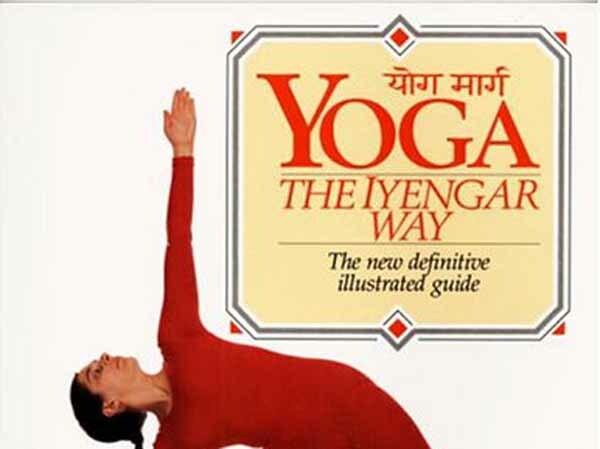 Let’s just say as long as there has been Iyengar yoga, which was focused on adapting yoga to those with physical issues, there have been yoga blocks. Most blocks would have been made from wood and perhaps cork. The history of yoga blocks is spotty at best. However, I do know it was not until the early 90’s that there was an alternative to wood or cork. Gaiam claims to have been the first creator of foam yoga blocks and that company was not founded until 1988. Now there may have been people using foam prior to this, but that was probably a cobbled together version much like the old wooden studio blocks. In other words, thinner pieces of foam glued together. What Gaiam created was a molded solid foam block and with this they began the ‘block revolution’. Gaiam hit the ball out of the park with the foam block. Unlike wood, foam is lightweight and has soft texture yet retains a density that supports weight and provides firm support. Unlike cork, foam is inexpensive and can be easily molded into shape. Foam also does not have that ‘cork’ smell and having a closed cell configuration is not as prone to crumbling and wear. At first there was just one version of foam block which was a 6″x9″x4″ rectangular shape. However, like anything good, competition sprouted up quickly. Currently there are a multitude of shapes, sizes and colors. 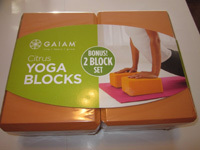 Gaiam’s Yoga Essentials block offers quite a nice selection of 9x6x4 rectangular blocks in various colors. These are very lightweight, just 1.5 pounds and perfect for stabilizing under your hands, under your feet or to sit upon. I would recommend getting two blocks so you can have an option for using them on both sides of your body in poses like the lunge. I also find it preferable to sit on two blocks side by side since my posterior seems to, shall we say, overlap a single block. If you are looking for a less expensive option, these Nu-Source are the same shape and size and a little lower cost for a pair. There are also slightly smaller rectangular blocks that are 9x6x3 inches such as these YogaAccessories blocks. This may seem like a small difference but these might travel just a little easier and for some activities that 1 inch less size improves their use. Just be aware that there is a difference so you end up with the size you want. There is even a larger rectangular block, the Hugger Mugger Big Blue Block which is exactly as it sounds, a big blue block. Its dimensions are 12L x 6.75W x 5H and I just added a few of these into my collection. The larger size is great for those applications you might put two blocks side by side to use since the single block makes for a more stable platform. I find these give me ample room to sit on and they are a little taller as well as longer which is a nice. I can tell you though that with my blocks it took a bit of time for them to air out. This block is not molded from a single form, but pieced together from three segments. That does not present any problem as the whole block is smooth and soft. What it does seem to add is a bit of odor, I guess from the adhesives used. Either that or this foam is just a little more whiffy than others. Whatever the cause after a few days of out-gassing in the garage they were good to go. 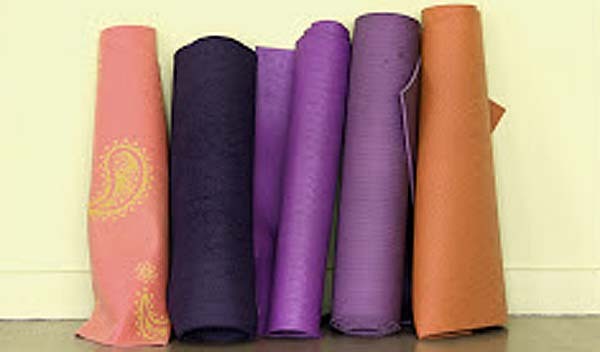 By the way, Yoga Accessories also seems to make one the same size, but less expensive. If you are looking for an even larger block, well, lucky you as I stumbled upon the Superblock which is a whopping 13.5L x 9.25W x 6.5L. If you need something bigger than that you probably should just grab a chair. I don’t have this monster in my collection yet, but maybe soon. Now, if you are not into rectangles or if you are really into oval shapes then you will be happy to know not all blocks have 90 degree edges. The Eggsecutive Ergonomic Yoga block claims it promotes healthy habits and is good for wrists. I have yet to acquire this block so I can’t speak from personal experience, but they are intriguing and it does look like it could adapt to wrist issues better than a standard rectangular block. It also looks like with their rounded corners they would be less stable than a regular block which is both good and bad. Good in that slight instability helps us to better strengthen our core. Bad in that if you are not expecting it, instability is, well, unstable. I do plan on getting some of these in the future and I will do another post about them once I have checked them out. Cork blocks are appealing because they are a natural material from a renewable resource. Cork is harvested from the bark of the cork oak tree when the trees are about 25 years old. The tree is then left alone for about a decade so it can regrow its bark. 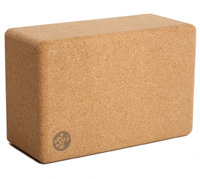 Manduka cork blocks are manufactured without toxic chemicals. The block is 9x6x4 and is slightly more firm than a foam block and weighs 2 lbs. Bean Products Cork Blocks are also 9x6x4 and come in a two pack for a great price. This cork is a larger grain and they claim it will not break down like smaller grain cork blocks. If you want to do it old school without the hassle of assaulting a tree yourself you have a couple of choices. Instead of pine, this is bamboo which is considered more sustainable since it is faster growing than a tree and renews itself after harvest. This one is 10x6x4 and weighs 2.5 lbs. If you are drawn to natural materials but still want a lightweight block, yet are not interested in cork, then the hollow wooden blocks might work for you, but if you are looking for absolute stability in a block that will not break then choose the solid wood. Some of us will always have that do it with what we’ve got attitude. Others are concerned with the environment and want to reduce their impact. Still others are looking for an inexpensive alternative. Whatever the reason, check out my next post where I outline how to make your own yoga block. ← Ask the Yogi: What is the IT band? I am always happy to include other points of view.